Kris Aquino, pro-Duterte and pro-Bong Go? Manila Bulletin writer and pro-Duterte social media blogger warns fellow Duterte supporters not to feel sorry for Kris Aquino or to start thinking she’s pro-Duterte because she is not. “Kris is just being pro-Kris. She’s pro whoever makes her life easier. Typical selfish brat,” Chu remarked. Photo grabbed from Krizette Chu’s FB. Check out Krizette Chu’s full FB post below. Kung totoong pro BONG GO si Kris, she would never have had given Jover Laurio money to destabilize this government. Kris is just pro Kris. She likes Bong Go not because he’s a decent, helpful human being, but because he says sorry to her and tries to placate her ego. That’s Bong Go’s way, even sa maliliit na tao. In the same way Kris told people not to touch BBM daw because wala daw ginagawa sa kanya and the law office of Liza Araneta handled her annulment. Quesehodang yung mga chuwariwap nyang Yellow galit sa Marcoses, even kicking out Irene Marcos Araneta and Yael B from Ateneo, basta siya wag daw awayin si Bong Bong kasi fellow ninong niya sa kasal. Everytime you’re starting to feel sorry for that woman or thinking she’s pro Duterte, she’s not. Siraan man niya hanggang langit si Mar at tawag tawagin man niyang Ironman si Pduts, she will never be pro this government. Kris is just being pro-Kris. She’s pro whoever makes her life easier. Typical selfish brat. Did Krizette Chu’s convincing power do wonders among her Facebook followers? Well, judging by the comments, it appears she has done a splendid job. Hope Villanueva She has God complex like Trillanes. 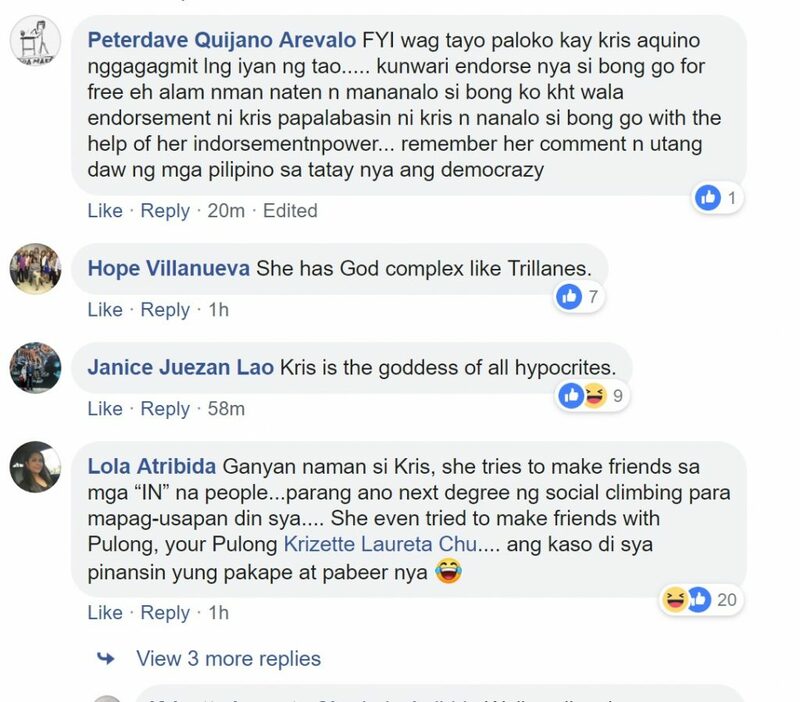 Janice Juezan Lao Kris is the goddess of all hypocrites. Did Sass Sasot just calls former Pnoy spokesman Lacierda “irreparably moronic” and “delusional” on Facebook? Well, she just did!